Create Your Best Possible Life! 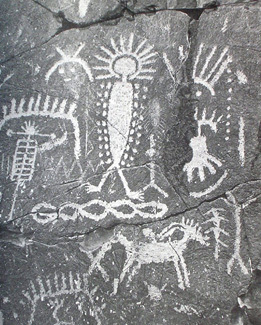 Rock drawings along the Columbia River near Beverly, Washington. Site now destroyed -- Wenatchee Museum photograph. Have you ever noticed how a pregnant woman has a special "glow," or a friend who's just fallen in love is "beaming"... or that an actor or singer on stage is "radiant"? These are all examples of the human bioenergy field, or aura in full glory. When your energy is bright and strong, you feel healthy, happy, and lucky, and have fewer accidents. If you feel you've been having more than your share of bad luck, poor health, or accidents, the first thing to check is your aura. Your aura, or bioenergy field, affects you on all levels: physical, emotional, intellectual and spiritual. When you feel like you are having a really great day... the energy around you is shining brightly and beautifully. The beauty that comes from within comes from your aura, so you can easily look your best when you are feeling your best. Pregnant women and people in love are often noticed to be so radiant that they actually glow. Everyone has an aura, although some show up more brightly than others. We are all energy beings, receiving energy that fills our bodies at birth, maintains the health of our physical bodies through our lifetime, and transitions out of our bodies at death. Our energy fields, or auras, have been recognized by every civilization on earth, and given a variety of names. The fact that most cultures and spiritual traditions in the world have names to describe the life force energy of the aura (such as qi, ch'i, prana, or ki) indicates just how widely understood it is that this energy is the key to our physical and emotional well-being. These energy fields have been portrayed in artwork on every continent, going back to ancient times and even appearing on ancient rock petroglyphs. 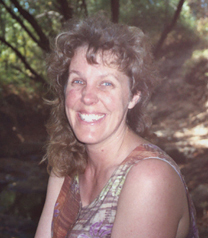 Modern aura photography and Kirlian photography show pictures of the aura that can be used to better understand how people are feeling and what general personality characteristics they have. People who are very physically active tend to have a lot of red in their auras, while people who are excited by change and keeping things new tend to have orange in their energy fields. 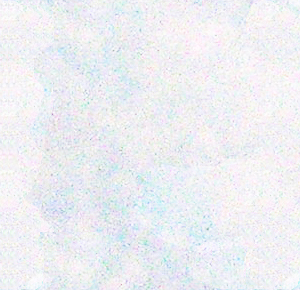 Most people have at least one color that shows up very prominently, although some people have a number of colors swirling around them... shining especially brightly around their head and shoulders, but often radiating outward around the entire body. Darker colors indicate emotional and physical distress, and places that can most benefit from energy healing. Our auras provide us with many benefits... and hold the key to the easiest way to stay happy, healthy, and enjoying a steady stream of good luck. Through our energy fields we gain high sense perceptions we can utilize to sense danger and opportunities, and the ability to connect non-locally with others. Our auras provide us with a basis for healing from a wide variety of ailments, afflictions, and diseases, and help us keep our bodies healthy. Our auras also give us a sense of which decisions will be best for us, and what we can best be doing in each moment and with our life in general. 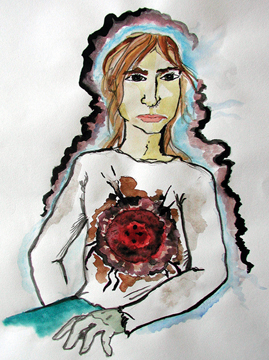 When people are feeling energetically ragged, their auras are often looking ragged, as well. 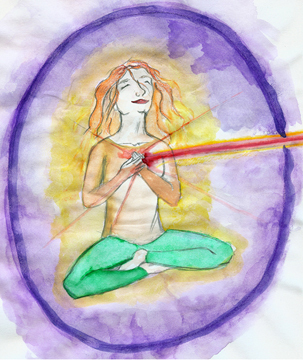 Our auras are all susceptible to being energetically damaged, and if our energy fields remain ripped or torn for long, we become vulnerable to physical ailments as well. Fortunately, physical and emotional well-being can be restored through energy healing treatments. At times when you are feeling highly energized (whether those feelings are positive or not), you will be most likely to experience visible shifts in reality. People who are under a great deal of stress and anxiety often notice they cannot find their keys or coat or wallet when they need them... although the missing items may show up later in exactly one of the places that had previously been searched. People who are feeling positively energized and expect to find good things happening around them (such as finding hard-to-locate parking places where they need them) usually do. To enjoy the ongoing benefit of experiencing a good day most every day, it is essential that you begin a daily regimen of good aura hygiene. Just as you brush your teeth every day in order to maintain good dental health, you need to care for your energy field every day in order to maintain good overall energetic health. You can do this through meditation and/or prayer, as well as through a number of excercise programs with a focus on the human bioenergy field, such as Qi Gong or yoga. When you pay attention to how the energy in your body feels in response to your thoughts and situations around you, you will begin to gain an understanding of where you may be energetically stuck. We talk about people "getting cold feet" before a wedding, for example. When we undestand that these types of very physical sensations actually begin as an energy sensation, we have to better appreciate and become sensitive to our energy and the energy around us. Such improved energy awareness helps us better hear the wisdom from our intuition and gut feelings, so we can more easily find our smoothest and most enjoyable path through life. 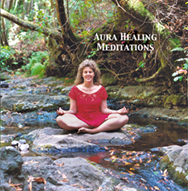 The Aura Healing Meditations CD will help you improve your aura... and your life... in every way. Even while you sleep! "The most phenomenal book ever written on Auras and energy"